Early(ish) on an unseasonable warm and bright Saturday morning in Norway, the final day of the Kongsberg Jazz Festival, I was at a kiosk poking at the festival T-Shirts. I was looking at the colorful wheel logo of the main festival shirts, but was also intrigued by the more suggestive line drawing of a person with a cigarette on a different one. "That is the special shirt," said the woman tending the booth, "it means you were a part of the festival that’s not for everyone." 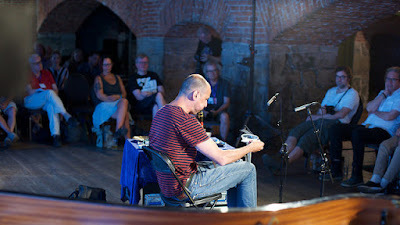 She was speaking about the Saeringfest - the festival within the festival - the one where John Butcher and Joe Mcphee played, along with Kaja Draxler and Susana Santos Silva, as well as Mat Maneri and Ståle Liavik Solberg, among many others - had played the previous evening. "Yes," I replied, "I'll take that one." Kongsberg is a small industrial city about an hour West-North-West from Oslo nestled in a valley. Coming down into town you see the ski slopes (now green with leaves and grass) and then a dense orderly jumble of homes and industry. 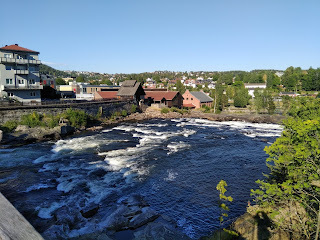 In the middle of the city is a wide fast flowing Numedalslågen river with a set of man-made and natural waterfalls that had at one point driven the industry. It was an old mining town, and I was told that now the main industry is making bombs. Wikipedia does mention that Kongsberg is where a large defense contractor is located, so I am assuming that my informant was correct. 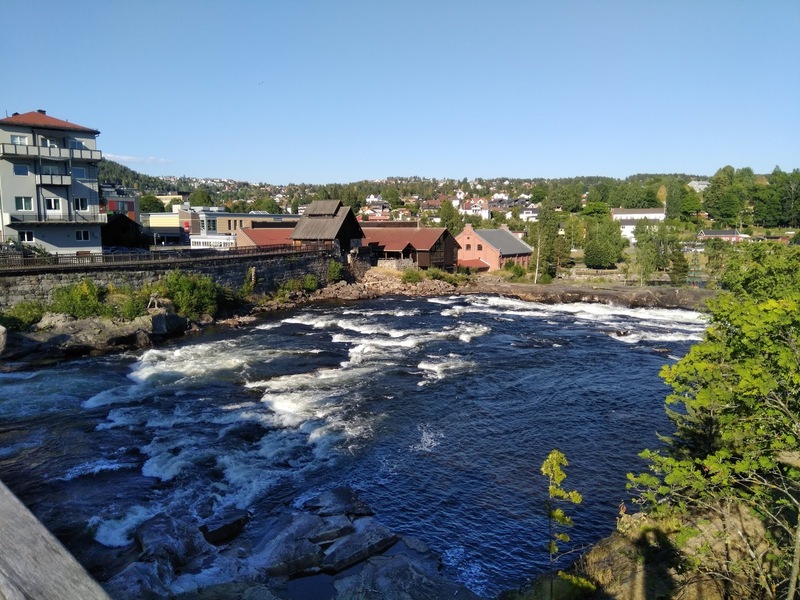 This particular early week in July, the whole town is transformed by the Kongsberg Jazz Festival into a bustling zone of street food vendors, techno-music blaring indoor/outdoor venues, and a confluence of people attending all of the festivals within the festival. It was a brilliantly programmed to bring together almost anyone ... for example, you could see Aha, Sting and Shaggy, and the Dum Dum Boys and nothing else if you'd like. Or you could focus on the well oiled jazz machine of the Chick Corea Akoustic Band, Mike Stern and Randy Brecker, and Greg Osby. Or you could go further off the beaten path. I arrived in Kongsberg around 3 p.m. on Thursday. I had really hoped to see guitarist Hedvig Mollsted and her trio performing, Mollestad's music tends towards metal ‘jazz’ and this concert promised to be an interesting commission based on the paintings of Ornulf Opdahl. I was not familiar with his work before, but it does seem to complement Mollestadt's heavy approach. 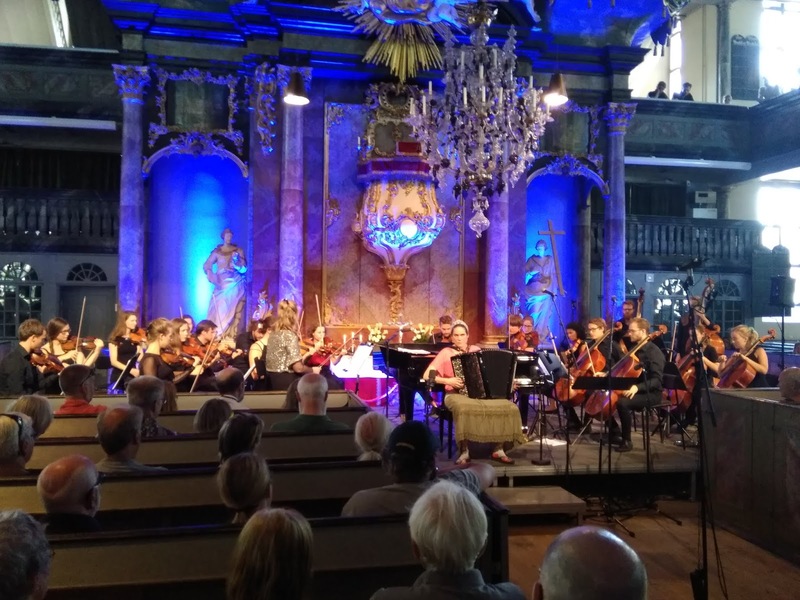 Instead, I began my day at the historic Kongsberg Church, seeing "Clashes", a classical/jazz mix that also involved a bit of theater. The opening sequence featured accordionist Ida Lovli Hidle, who dressed in old fashioned clothing, wandered up to the stage where she met up with the chicly clad Ensemble Allegria. Admonishing words were pantomimed between the lead violinist and the accordionist and the light tune she had been playing turned self-conscious and fearful. Riffing off the clash between the orchestra and soloist, they engaged in a captivating give and take. The rich interplay grew tenser and tenser and the orchestra began verbalizing. Then, they whispered harshly "Do you think you can just come in for free?" Then, hitting a musical stride, the tone turned darker, and they said "go away!" It was hard to not hear it without thinking about the current sentiments in Europe about migrants and refugees. The irony of course is how incredibly lovely the music that they made together in this turbulent dance. As the group started on their next piece, I made my way to the modern concert/movie hall a little further over the hill, to see the Erlend Apneseth Trio. Apneseth plays the Hardanger fiddle, a traditional Norwegian instrument with 8 or 9 strings - four playable strings like a violin and the others sympathetic ones vibrating below the fretboard. The trio, with guitar and drums, had reached a droning crescendo at the point in which I entered the hall, and carried these vibrations to a climax. With an array of acoustic instruments and a pile of electronics next to the guitarist, the group drew deeply on folk music but with obviously more modern rhythms and treatments to create mesmerizing songs. Charged with long repeating segments and exhilarating accelerations, the group played an exciting, but simultaneously, relaxing set. 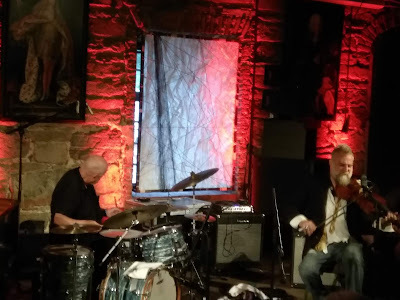 I followed this up with the Jon Run Strøm Quintet at the Energimolla rock club set in a historic brick building at the very bottom of the valley, on the other side of the river. 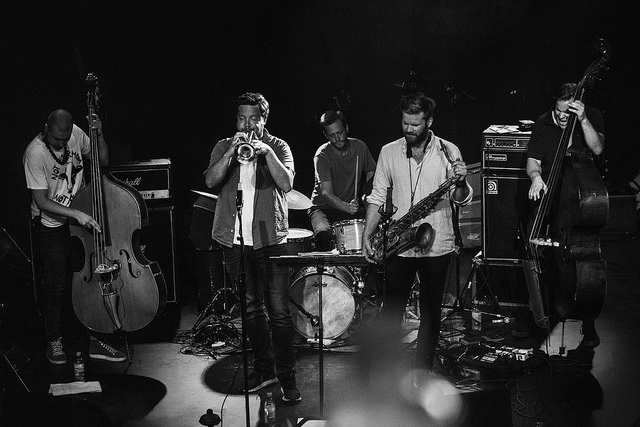 Bassist and group leader Strom writes catchy and quite rhythmic jazz that plays off traditional free jazz and hard bop, and is brought to life by trumpeter Thomas Johansson, saxophonist André Roligheten, second bassist Christian Meaas Svendsen, and drummer Andreas Wildhagen. All four players are deeply entwined in the Oslo music scene which hosts other high octane jazz groups like Cortex, Gard Nillsen's Acoustic Unit, and Friends & Neighbors (to name just a few!). The set opened with the two bassists playing kicking up a cloud of musical dust, while the horn players stood in between with eyes closed. The drums came in, one bass began a more tuneful bass-line and then, the sax with a theme that at times pushed the technical edges of the sax but never went totally over the top. The trumpet took over and with laser like focus pushed the band up to the next notch: the music was alive! 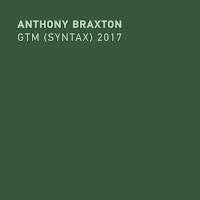 The compositions are vehicles for the horns, and Strom’s rhythmic concepts allow for a great deal of freedom and invention but never leaving the 'tune' behind. This is true for the basses too, Svensen delivered a deep and sinewy accompaniment-free solo and then was joined by Strom for a tasty contrast of styles, which finally wrapped seamlessly back into the group. 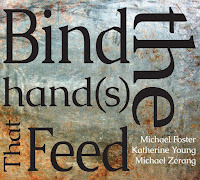 Check out their recent Clean Feed recording here. The last concert I attended was on my highly anticipated list - no, not Sting and Shaggy who were playing up by the church, but rather En Corps, with pianist Eve Risser, double bass player Benjamin Duboc, and drummer Edward Perraud. 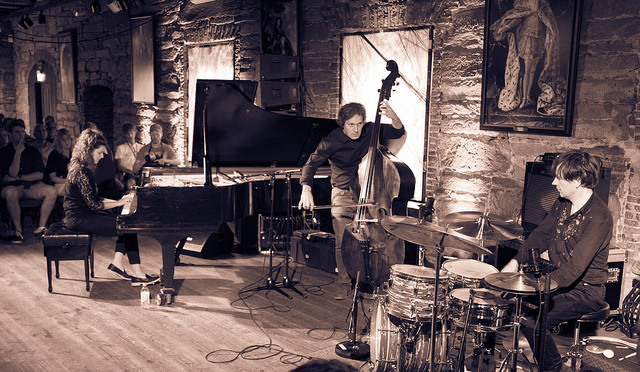 The piano trio lit up the end of year lists on the blog back in 2012 and only followed up in 2017 with their second album. 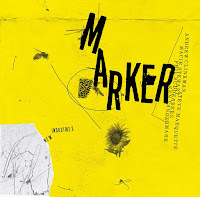 Risser just released a duo album with pianist Kaja Draksler and a tremendous large ensemble album White Desert Orchestra two years ago. The group began by playing with expectations - a quiet rattle from the prepared piano, gentle droning notes from the bass, and a splash of high-hat. As the music picked up not a sound or note was out of place, be it a scape of the drum or pluck of a muted piano string, each carried the music a bit further with purpose and poise. 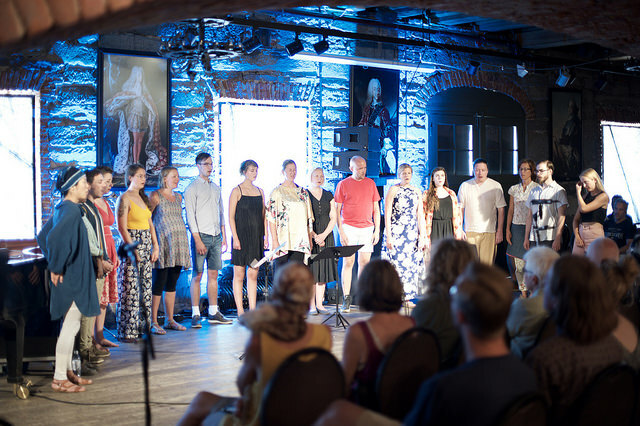 When the change came, the stage had been set, and it came as a sweet surprise: fleshier chords, thicker bass lines, and the percussion switched from a pulse to a rhythm. The repetitive piano figures were interspersed with intricate passages and the group soon became a tightly controlled tornado of sound. The climax came over an hour into the long arc of the piece, after an intense drum solo and an ecstatic piano pressing again and again on a chord until it was bouncing off the brick walls and low ceiling of the Smeltehytta. At 2 p.m. the 12 members of the Scheen Jazz Orchestra, led by trumpeter Thomas Johansson, filled the deep stage of the Energimolla. The first blast of the band announced the bombastic anthem which they would return to again later. It quickly changed into a driving groove and a core piano, bass, drum and guitar (Even Helte Hermansen of Bushman's Revenge bringing some of the power!) 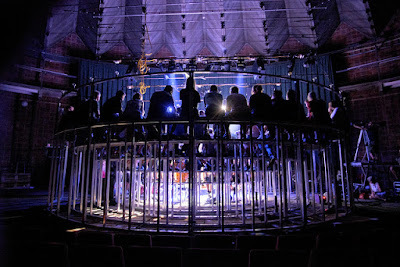 Johansson was stationed towards the side, directing the band, and signaling the return to the theme which rose in energy each time it came around. They broke into a freer section featuring an out solo by the alto saxophonist. Then Johansson and the tenor saxophonist engaged in some free playing, bouncing sounds off of each other, picking up on each other’s ideas. Other textures came into play as well, a flute during a reflective moment, a piano led small group interlude, all adding to the shifting tonal pallet. The packed house burst into applause at the end and as the band began an encore song. After a quick bit of trumpeter Mazen Kerbaj and drummer (and one of the festival organizers) Stale Liavik Solberg performing at a small art gallery nearby (I was only able to catch the final moment of their performance), I checked out the Chick Corea Akoustic Band performing in the large Kongsberg Musikkteater. I owe a lot to Corea, in fact one of my first CDs that I ever owned was Romantic Warrior from Return to Forever, bought used at Pier Platters in Hoboken, NJ. I was malleable enough to dig the baroque fusion and it led me to Corea's first Akoustic Band album. The group, Corea, bassist John Patitucci and drummer Dave Weckl began with 'Morning Sprite' off their eponymous album. A highlight was Corea’s tune 'Life Line', which featured the angular melody and exciting syncopations he is known for. However, it was Pattitucci's bass solos that had the audience erupting into applause each time. I had hoped to catch the festival's featured artist Marius Neset sitting in Corea. 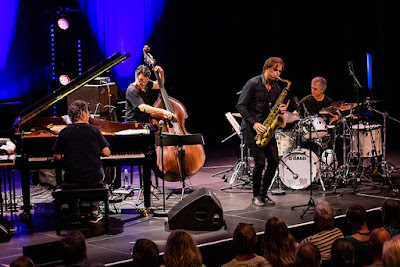 Neset has been described as " reinvigorating the post-70s fusion ‘big tenor’ tradition of Michael Brecker, Chris Potter and Jan Garbarek", and I could imagine it being a nice match. However, things were piling up and I was eager to get on to the next event. 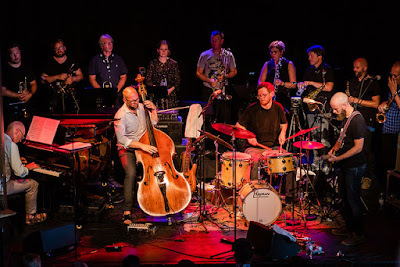 The Saeringfest, back in the Smeltehytta, was the center piece (for me) of the Kongsberg Jazz Meeting part of the festival, perfectly programmed for adventurous listeners. Drummers Solberg and Paal Nilssen-Love - whom also curate the Blow Out! festival in Oslo in August, booked this festival within the festival, and themselves book-ended the venturesome performances. The care and thought behind this series was evident from the line up to the sequence to the setting. In the dark, medieval-feeling setting of the old smelter. 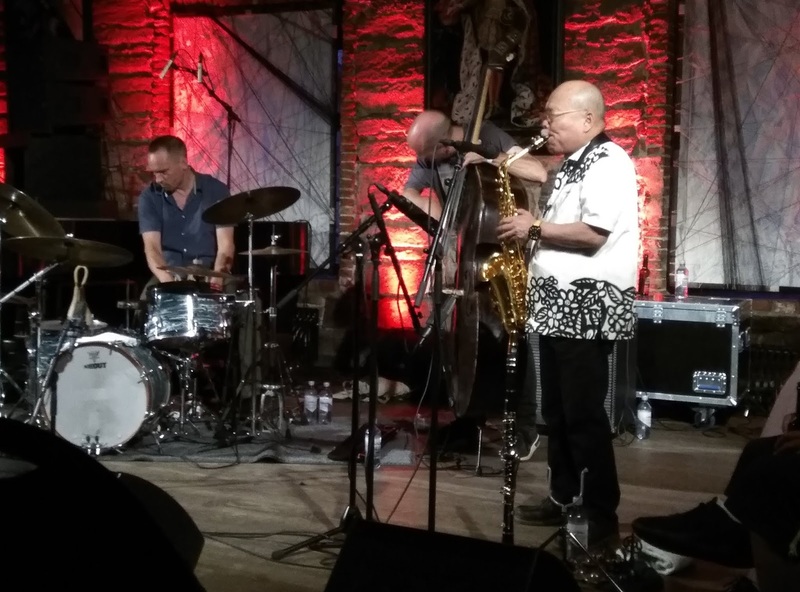 Opening the event was a quintet consisting of vocalist Agnes Hvizdalek, trumpeter/saxophonist Joe McPhee, bassist Pascal Niggenkemper, saxophonist John Butcher, and Solberg. Hvizdalek began with an array of sounds from click and chirps sounding like her own language, as the others filled in behind. Butcher made the first move away from the groups’ collective churn, playing a series of overtones while answering in his own dialect. McPhee then took over with a spirited passage on trumpet and saxophone, alternating between melodic lines, overblown sax, and the occasional vocal outburst. The vocal solo was the most unusual collection of pops and clicks, and was a good match for Solberg who peppered his playing with scrapes and slides in response, and Niggenkemper, with his trademark lamp shades, provided both bass and buzz to the underlying sound. The music was a beautifully connected collective effort, together spinning an unusual world of sound. 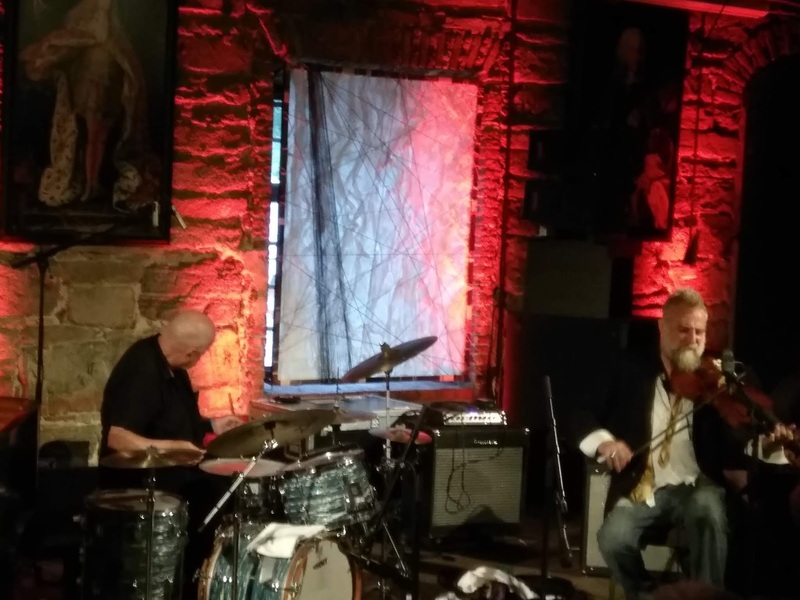 Next up was the duo of violist Mat Maneri and percussionist Randy Peterson - a collaboration with a long history which showed throughout their strong performance. 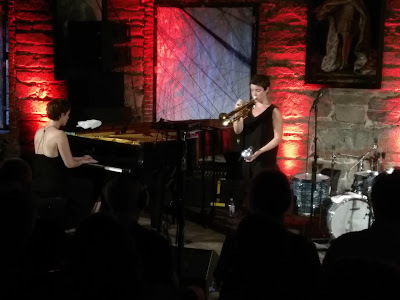 Maneri played deeply engaging melodies and Peterson pushed and prodded the violist. Moments of quiet inflection befit the spare instrumentation, but they also filled the room with a booming intensity. The flow of ideas was non-stop with Maneri dramatically using double stops and sonorous legato notes. However, it was a solo by Peterson that was the highlight of the set – so inspired that the audience burst out in such appreciative applause that the musicians just stopped, nothing more needed to be said. Following the energetic arc of Maneri and Peterson came the piano and trumpet duo of Kaja Drakler and Susana Santos Silva. The duo released 'This Love' on Clean Feed a few years ago and their connection as a duo was as intense as the previous one, but expressed differently. 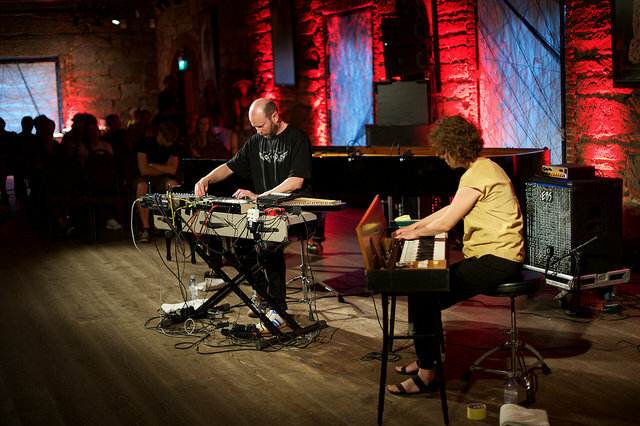 Drakler's prepared piano provided a vibrating underlayment to Silva’s microtonal explorations, creating together an ethereal atmosphere. Together, they seemed to be looking inward and listening closely to each other. The pianist struck a delicate balance between notes and prepared sounds, and Santos responded lithely. A blast of extended technique followed, a rumble of the piano’s lower end and shaping of the strings along with fuzzy blasts from the trumpet came together in an fervent union. The last group was Arashi, the turbulent trifecta of saxophonist Akira Sakata, bassist Johan Berthling, and drummer Paal Nilssen-Love. The group’s name means “Storm” in Japanese and they lived up to it wholeheartedly starting with a blast of sound that could have been mistaken for the historic smelter firing up. It was classic free jazz brimming with technique and passion. PnL was a precise percussion machine, giving the group its throbbing pulse. However, the duo of Berthling and Sakata could have held their own. Sakata saxophone played with a mixture of passion and technique (a mix of Brotzmann and Vandermark) in an interrupted flow (like Irabagon), while tearing at the instruments seams. His clarinet playing revealed a more introspective side, just as expressive, though a bit gentler. At one point, Sakata turned in a vocal performance, throat singing nonetheless and then deep growling words in Japanese, that was at once startling and perfectly organic. The group’s control was impressive, and their ability to dial it in and turn it up gave the show a dramatic flourish the encapsulated a thoroughly engrossing evening of music. Leaving the hall into the light Norwegian night, the famous opening rift to Ah-Ha’s “Take Me On” wafted over the streets and, though I had had enough sound for the day, I still wandered over to the Energimolla for a musical night cap by the energetic "Afrobeat, Ethio-jazz and big band funk" fun of the Goran Kajfes Subtropic Orchestra. 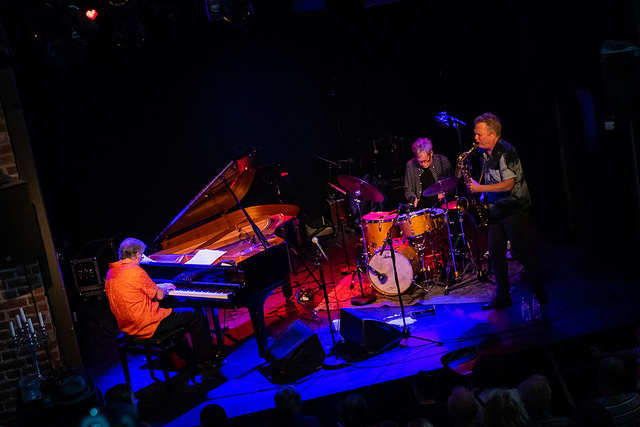 I awoke Saturday looking forward to the trio of the legendary pianist Bobo Stetson and drummer Jon Christensen, with the soon to be legendary Fredrik Ljungkvist (I’m basically ripping this description from the program notes). Again at the Energimolla, I made sure to get to the club a bit early to get one of the coveted barstools on the upper level, and sat with two long-term Kongsberg Jazz Festival attendees from Tromso. Chatting a bit, they told me about older festivals and how this one had grown so much over the years. Our conversation soon turned to what we’ve been listening to, rare record finds, and up and coming musicians we’re excited about. Avant-garde music, the universal language on unity. Stetson's trio began with slow and spaciously with flowing runs and pointed notes. Ljungkvist's playing was energetic but restrained, you could feel the potential energy behind it as he pushed at the light structures being floated by the pianist. Christensen's spare clatter against the drum’s rims, along with the cymbal splashes added color but also hinted at a greater force to come. After the first minor flare up, Ljungkvist switched to clarinet, and the woodsy sound melded nicely with the with piano and drums. The music took on a classical bend, delicate an assured, each note meant to savored and enjoyed. The pianist and reed player bounced off each other as Christensen's drumming provided a running commentary. They segued into a bluesy tune that moved at torch ballad speed, and Stetson found some Monk-ish voicings to offer. An energetic tune followed, with strongly articulated angular lines from the saxophone and fierce block chords from the piano. The dry spare sound of the group veered between the romantic and adventurous always with thoughtful motion and grace. A rather perfect start to the day of music. Next, I made my way back to the site of last night's Saeringfest and took a seat for a series of performances that could in a sense be considered an encore to the previous night, even reprising some of the musicians. First up was Avanthagen: Oslo 15 & Sofia Jernberg. The all vocal group gave me pause, at first, as I am not the most amendable to vocal improvised music, however the presence of Jernberg, whose work with the Fire! Orchestra and some other groups over the years has impressed me. The group began with a weary sounding "ahh", followed by chirps, guttural moans, and a buzzing like a hive of bees. My curiosity was piqued and defenses lowered. They proceeded with an evolving set of sounds, seemingly led by certain unusual sounds, which I attributed to Jernberg. There was some sort of use of an iPad as well, perhaps guiding the musicians to act together, creating sounds and passages along varied tonal themes. Individual voices would rise above the group, sometimes conveying strife, consonances, and sometimes just weirdly alien sounds. I overcame quickly my original prejudice, and enjoyed this effecting and engaging performance. Lebanese trumpeter Mazen Kerbaj, of the "A" Trio, came up next with his instrument and a table full of accessories - like plastic tubing, lids, and little rattly things. His prepared trumpet consisted of, at first, attaching the long tube between the trumpet and a saxophone mouthpiece. Placing the lid above the horn's bell, which sat upright on his lap, he began blowing into the tube. More like an industrial era engine than an instrument, the sound was a mechanical whir that he kept adding more to, as he slowly manipulated the sound through the intensity of the air pressure. 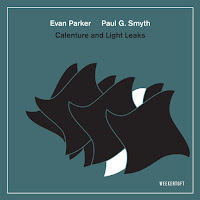 His Rube Goldberg approach to the trumpet was visually captivating, as its operation was magical, and sonically unusual. Rounding out the short series was a duo of woodwind players John Butcher and Akira Sakata. At the previous night's mini-fest, they both played contrasting shows, Butcher probing and Sakata fiery. Meeting up here, their two distinct styles came together well. Starting out quietly, they soon reached an assured middle ground. With Butcher on tenor and Sakata on alto, they moved through rapid scales, flirted with extended techniques, and blurred notes together. 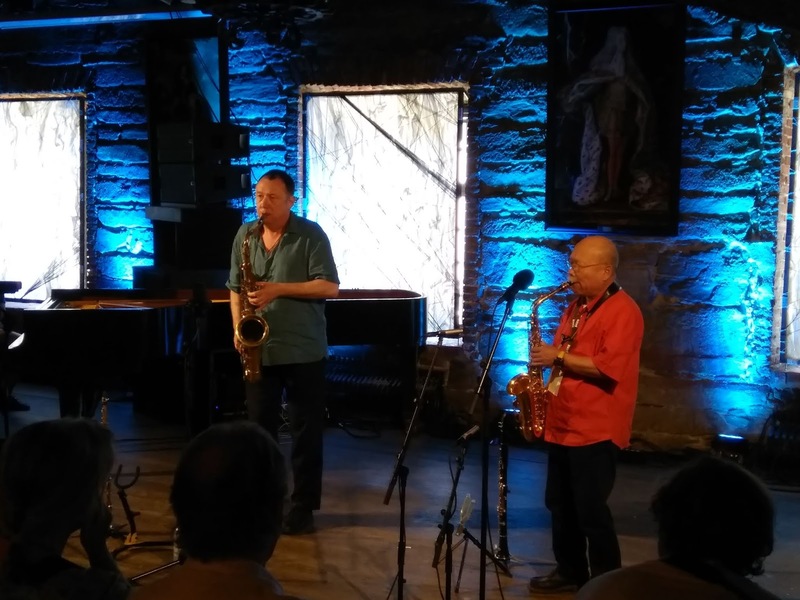 Moments of swirling saxophonics were hypnotizing - and when the pitch really rose - demanding. At one point, Sakata took out a small bell, and with throat-singing and an idiosyncratic language of sounds, gave Butcher a unique challenge to respond to on his soprano sax. They ended as they began, Butcher on tenor, Sakata on Alto, confidently twisting about each other, looping over, under, and through each other’s musical threads. 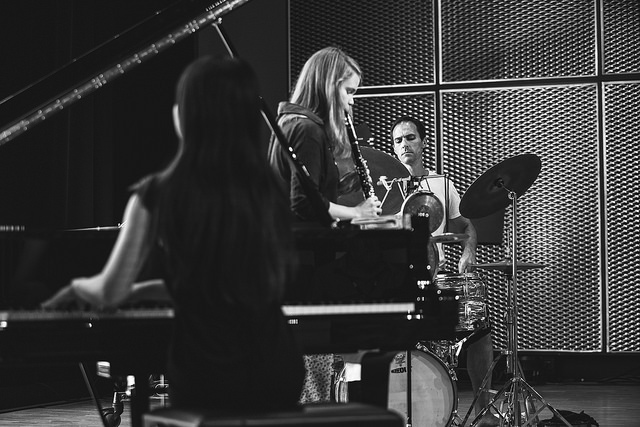 The evening's concerts began with the trio of drummer Thomas Strønen, pianist Ayumi Tanaka, and saxophonist Marthe Lea. The delicately expressive group played fittingly against a huge floor to ceiling windows looking out on what could be an ECM album cover - if you took away the ubiquitous construction crane in the middle of the frame. They began with a minimal repetitive figure under floating chords, gentle notes from the sax, and a guiding pulse from the drums. Suddenly, they built up to a fast peak, then, they let it go. Strønen's drumming, on a kit extended with a giant concert bass drum, is an expressive and reliable well of inspiration. He guided the group suggestively from his seat, while Tanaka's approach on the piano seemed to gentle extract the notes from the keyboard, rather than percussively striking them. Lea's tone on the saxophone was strong and a perfect complement to the crystalline tension between Tanaka and Strønen. 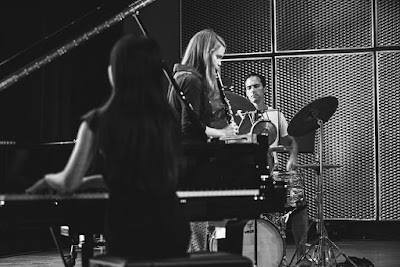 Lea's restlessness on stage had a little bit of a distracting effect however, walking around when not playing sax, she struck strings within the piano, and tossed percussion elements around stage, which seemed a bit extraneous. Regardless, just the opening moments of this young trio’s music was enough to soothe any fears about a next generation carrying forth the cool "Nordic Sound", their gentleness, quiet urgency, and reserved storminess demonstrated the music is in good hands. One of the feature concerts was artist in residence saxophonist Marius Naset's trio with guitarist Lionel Loueke and cellist Svante Henryson, which was held in what amounted to a steel cage inside the town's mid-century circular movie house (which has probably been replaced by the gorgeous new movie theaters across town where I caught a screening of the John Abercrombie documentary "Open Land" - a must see for appreciators of the late guitarist). Playing Naset's compositions, the music was a mixture of classical, jazz, and folk - with a strong strain of Americana emanating primarily from Henryson but also reflected in some of Loueke's voicings and skeletal chord choices. The guitarist also vocalized behind his guitar lines. Naset wove delicately behind and before the strings, sometimes shadowing the chord melodies, and other times soaring over them. 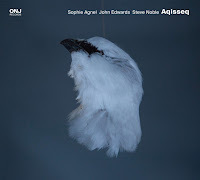 The music was convincingly modern with its syncopations and occasional rock-like passages, but at the same time folkish in it directness and earthiness. A short solo piece from the cellist, steeped in American folk and bluegrass, with counterpoint, double stops, and a finger picked like melody, was jaw dropping. The groups smooth transitions obliterated the stylistic boundaries but at the same time, their virtuosity never obscured their music. Back at the smelter, pianist Magda Mayas and electronics wizard Christian Wallumrod were refining the air around them. Mayas plucked at the strings in the piano while Wallumrod produced dark electronic noises. There was no hard delineation between the acoustics and electronics, it all blended into a steaming ingot of sound. Mayas moved from the piano to the Clavinet, however the overall effect of their efforts was to stay the course, with a rhythm established by the electro-acoustic pulsations and the unconventional extracting of sounds from their instruments. 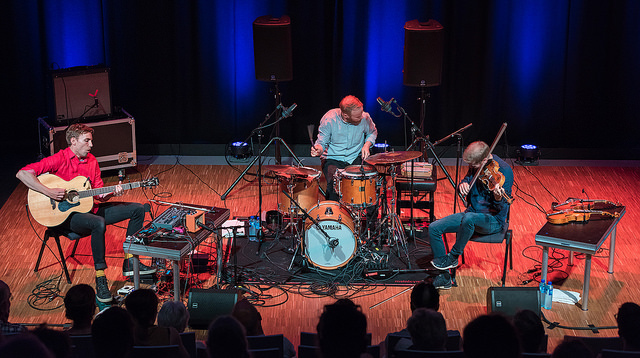 Like the night before, the day ended at the Energiemolla, this time with violinist Ola Kvenberg’s energetic show the was a cross between a jam band, virtuosic prog rock, and early fusion. A perfect ending to a musically adventurous and exhausting festival. It’s worth noting that a festival like Kongsberg does not spring forth from nowhere. Aside from it's long history (it's been held every year since 1964), behind the scenes, and making the scene, is a strong network of government offices, schools, and private organizations dedicated to supporting the arts and the artists. In a time of ever increasing hostility to the arts, especially in the US, it's important to take note of what Norway is doing. 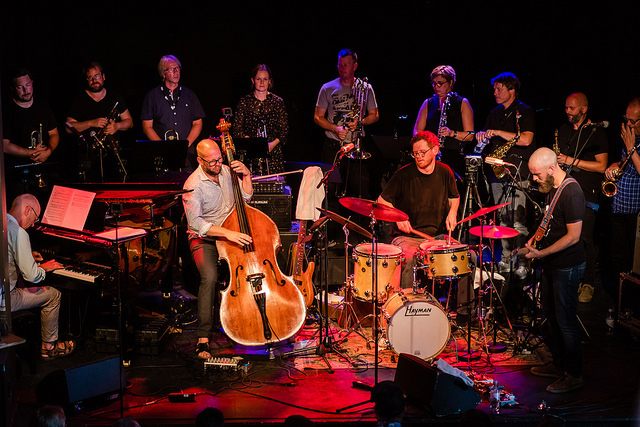 I won't profess to understand it all perfectly, but essentially there is a strong network of regional "Jazzsenters" with some government funding helping to organize and support jazz musicians and groups and which are a driving force in the Norwegian jazz scene. Speaking of which, the club "Nasjonal Jazzscene" in Oslo too plays an important part in giving musicians a high profile venue to perform. 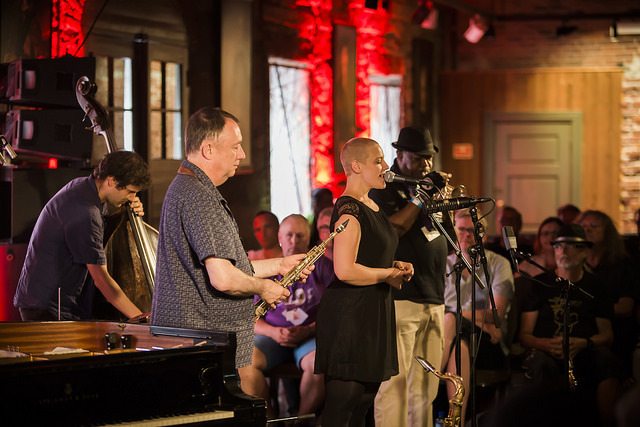 There is a lot to admire about people making a concerted effort to support music, and the ones who dedicate their lives to making it, and a festival like the Kongsberg Jazz Festival and its Kongsberg Jazz Meeting component is but the tip of an iceberg.